It's no secret, "dinosaurs, fossils & minerals fascinate children and the child in every adult." Everyone wants to see and touch pieces of Jurassic history. Until now, most kids and adults have had almost no opportunity to handle these ancient treasures. That is about to change for North Carolina and Texas with Dinosaurs Rock®, "Dinosaur Parties, Educational Programs and Events." By effectively added the sense of touch to learning about dinosaurs, fossils and minerals. Children can become a junior paleontologist digging for fossil treasures and experience the wonder of life over 65 million years ago at home, at school or at community or business promoted events. 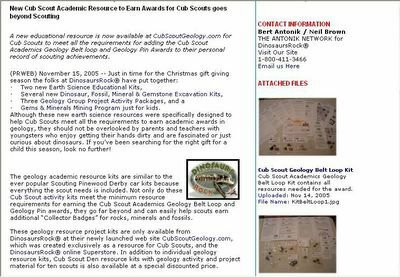 Cub Scout Academics Geology Resource Kits are available now. Just in time to get filled on Santa's Christmas list. The >>> "PR Web Press Release PDF File Download"<<< is also available. We know Kids Love Dinosaurs and the word is getting around. Take a peak at the post by Dinosaurs4Kids. And while your at it, don't miss the Press Release. Can the Dinosaurs Save Christmas? It seems the Elves May Revolt. How will this effect your holidays? A real "Dinosaur Birthday Party" is an event few Kids and Adults expeience. Some are better than others and the ones put on by "Dinosaurs Rock®", who bring the Museum to you, seem to be the best. How about having a "Real Fossil Dig" in your back yard? Kids love dinosaurs and having this kind of birthday event is fun, entertaining and educational too. Gems Rock™ Jewelry-Making Party for Girls. Do you have a Blog that might interest visitors at this site? Let us know and maybe we can list it here. "We Bring a Dinosaur and Fossils Museum to You!" American Dinosaur Fossils Exchange - Buy, Sell, Trade and Inquire about Fossils. Dinosaur Replicas - Museum quality dinosaur replicas for private collectors. Dinosaur Reproductions - Finest quality dinosaur reproductions for sale. Fossil Connoisseur - Portal page to other dinosaur and fossil related sites. Dinosaurs Rock New Zealand - Dinosaur Camps, theme parties, educational events. Dinosaur Kids Party - Dinosaur fun, entertainment and educational programs. Dinosaurs Rock - Dinosaur events, announcements and activity programs. Dinosaur Birthday Party Ideas and kids dinosaur birthday party supplies. School Assembly and After School Programs - Dinosaur, Fossils, Earth Science and Natural History presentations and activities. Dinosaurs Rock California - Dinosaur theme mall events and promotions. Dinosaur Birthday Party Blog - Dinosaur Parties and event updates pictures and video.